One of the reasons the state can’t pay these vendors – or many of its other bills – is that the rising annual cost to pay down its debt is crowding out spending on most other programs. 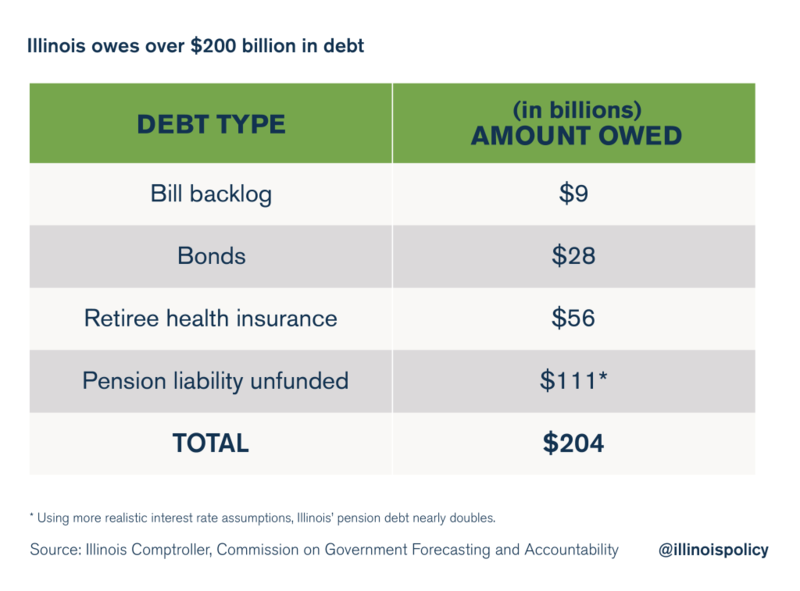 Illinois is sitting on a mountain of debt worth $204 billion. Illinois owes so much money to its bondholders, vendors and pension funds that it now spends more on paying off its loans than it does on its human services programs. Unless the state cuts back on its debt, social service providers and other state programs will continue to bear the brunt of Illinois’ fiscal mess. 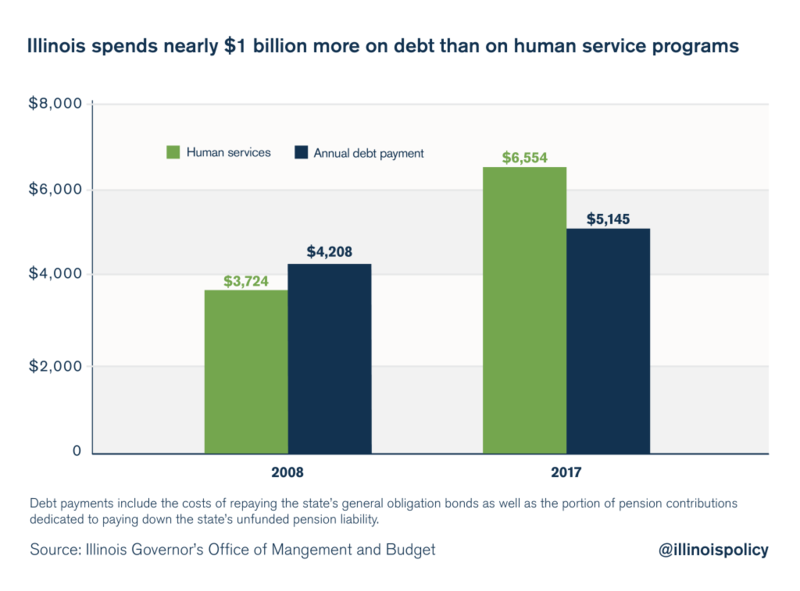 In 2008, Illinois spent $500 million more on human service programs than it did on paying back its debt. By comparison, annual debt payments in fiscal year 2017 are approximately $1 billion more than the $5.1 billion the state will spend on human services. And yet another $56 billion is owed on government-worker retirement health insurance liabilities. 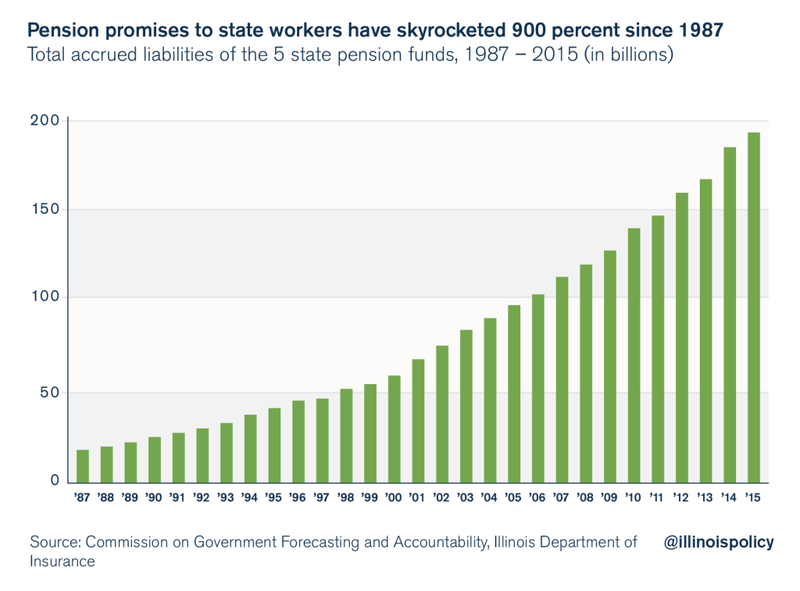 The driver of Illinois’ debt is its overly generous pension benefits. In 1987, the state owed its workers and retirees just $18 billion in total benefits earned. By 2015, the state owed those retirees and workers $190 billion – a 900 percent increase. That unprecedented growth rate far surpasses the growth rates of state revenues, inflation and taxpayer incomes during the same period. That growth is the reason debt costs have taken over the state’s budget. 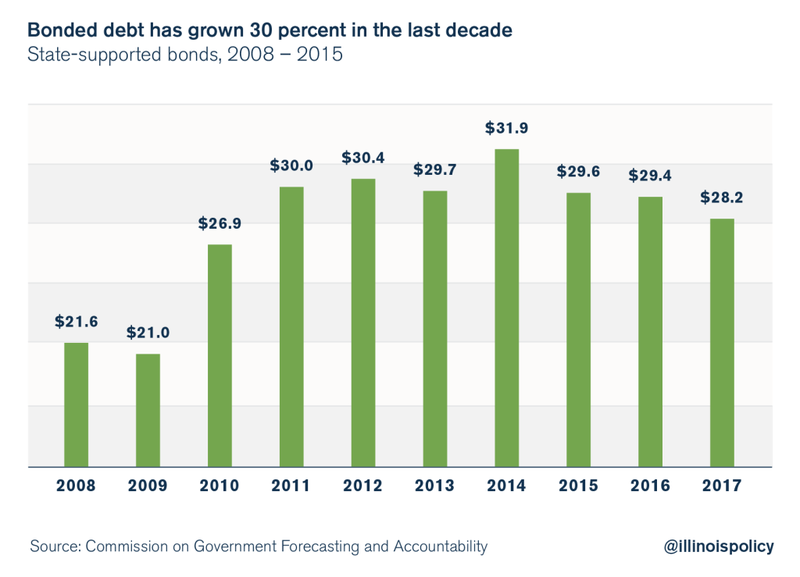 In addition to its pension debt, the state owes billions more in bonded debt. That debt has jumped primarily due to the government’s borrowing to pay for pensions. Former Gov. Rod Blagojevich borrowed $10 billion in 2003 to help prop up the state pension funds. And former Gov. Pat Quinn followed suit and issued more pension debt – $3.5 billion in 2010 and $3.7 billion in 2011. In total, the state now owes nearly $30 billion – that’s up 30 percent from 2008. The state’s growing debt is crowding out payments to social service agencies. Instead of pension reforms to lower the amount and cost of debt, politicians continue to call for tax hikes to pay vendors. That’s led to record property-tax hikes and utility-tax increases in Chicago, increased sales taxes in Cook County and statewide proposals for a progressive income tax, a millionaire tax and higher gas taxes, just to name a few. Illinoisans already bear some of the highest state and local tax burdens as a percentage of their income, and that includes the highest property taxes in the nation. The real problem isn’t that government doesn’t have enough revenue – it’s how the state spends the tax dollars it already has. Illinois needs to reform its pensions and stop borrowing money. Until then, social service agencies will continue to feel the pain of the state’s fiscal mess.